Easy 5-ingredient Basil Alfredo Sauce for vegan and gluten-free sauce recipe! I never thought I’d be so obsessed with a mock alfredo sauce until now. 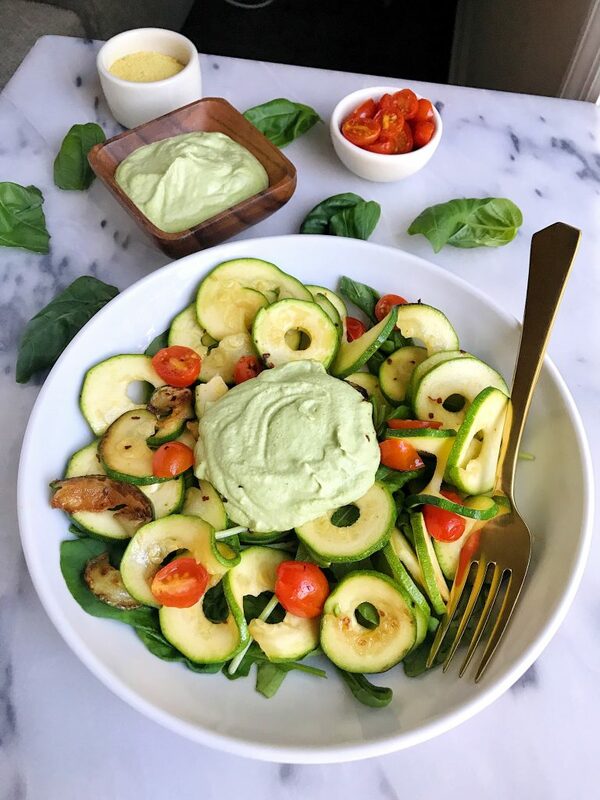 This Basil Alfredo Sauce pretty much combines two of our favorites into one delicious plant-based and whole30 approved recipe. A mock alfredo sauce that isn’t filled with heavy creams but instead we use soaked cashews to help get that creamy and thick texture. There are only five simple ingredients in this recipe and you can have Basil Alfredo Sauce on your plate in less than 30 minutes. You don’t need to soak the cashews overnight or for hours (although if you prefer/have more time you are welcomed too). Instead I soaked them in boiling hot water for about 20 minutes then strained. They were very easy to blend into that creamy consistency. I also added some nutritional yeast, water and garlic to the blender for extra flavor. The nutritional yeast adds that “cheesy” flavor but none of the cheese. Think of it like the parmesan you sprinkle on top of your pasta or use in pesto. You can also use any non-dairy milk in this recipe too instead of the water to make it even creamier. I planned on using almond milk but my grocery store was out of my go-to. Water works perfectly in this. The basil is the real star the sauce. I used some of the basil from Bowery. 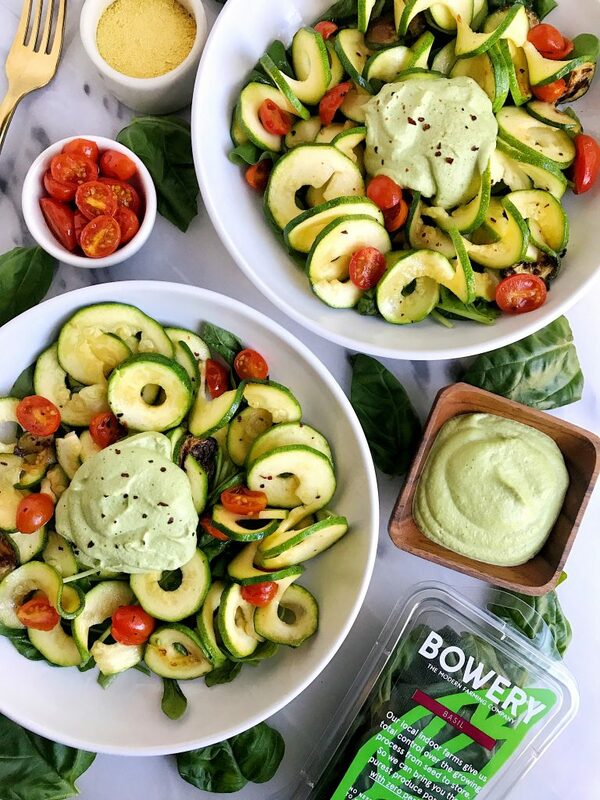 Bowery is the new modern family farming company. They grow post-organic and pesticide free greens like basil in their indoor farm. The are complete innovators in the farming space. Every crop planted in a Bowery farm is grown without pesticides and they are able to full control the entire process and use 95% less water than traditional agriculture. More on their system here. I was extremely impressed with the basil from Bowery. It was full of flavor and I loved that it was already washed before hand. 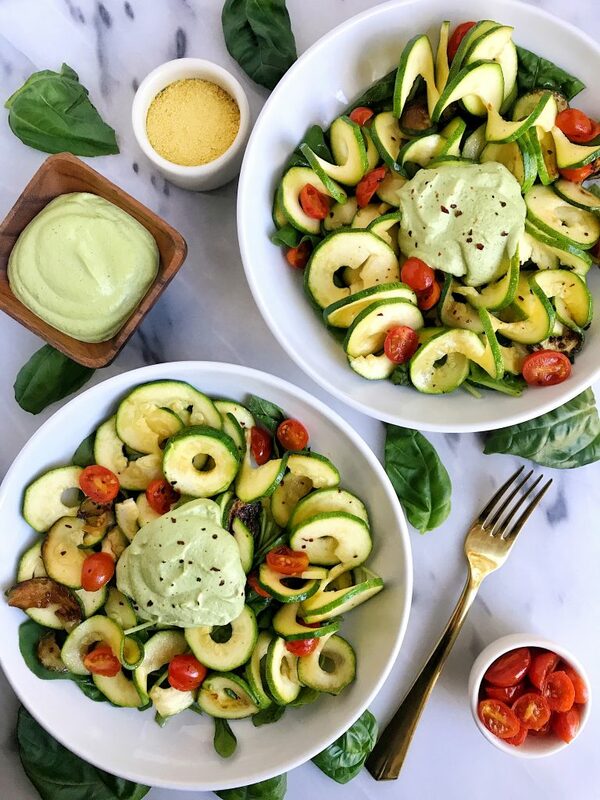 This 5-ingredient Basil Alfredo Sauce is vegan and whole30-approved. 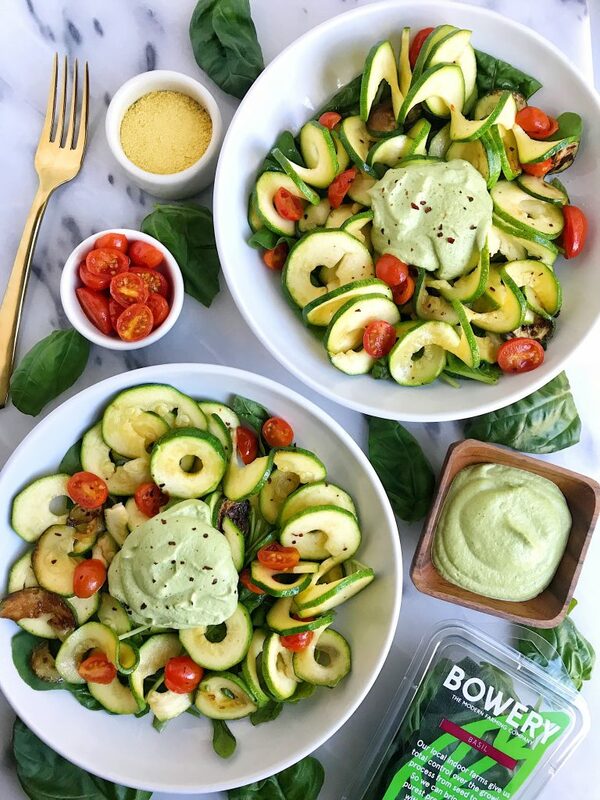 I loved mixing it into my zoodles with some protein or you can even smear it on toast, use as a salad dressing, anything! I personally think it tastes best on warm pasta like traditional alfredo but you can get creative with leftovers! Remove from blender and enjoy with your pasta or noodles of choice! It is also a dreamy spread on toast. Thank you Bowery for sponsoring this post. It means so much to me to work with brands that I love and who support rachLmansfield!